Viking Jewelry and glass • The Lewis Chessmen, and more! Visit our sister company The Viking Trader to view high resolution images of some of our products. NorseAmerica is the gift buyer’s guide to authentic Viking culture. We are a Viking history store. NorseAmerica is a private company owned by a Norwegian and American husband-and-wife team. Our goal is to provide the finest gifts of Norwegian, Danish, Swedish, Scandinavian and Viking culture. Whether you’re looking for Scandinavian gifts, or gifts for that hard to buy for Viking in your family, we’re sure you’ll find them here. We offer unique Norwegian gifts from our country of Norway. We have gift manufactures in other Scandinavian countries and import unique Danish and Swedish gifts. We are committed to offering unique Norwegian, Danish, Swedish, Scandinavian and Viking giftsthat are imported exclusively by our company. NorseAmerica is the exclusive importer and or distributor for Sigvat Designs, the Viking game Hnefatafl, The Lewis Chessmen, the Gods of Asgard graphic novel and many other Norwegian, Danish, Swedish, Scandinavian and Viking gifts. Our gift items are based on Scandinavian history and have their own unique story to tell. The Lewis chessmen are the most famous chessmen pieces in history. Our Viking Isle of Lewis chessmen, are cast directly from the original Lewis chessmen artifacts from 1100 AD. Our Lewis chessmen will by cherished by your family for generations. We import the premier version of Hnefatafl.The Viking game Hnefatafl was the most popular board game of its time. In fact, it was a household word when people could actually pronounce Hnefatafl (nef-ah-tah-fel). Hnefatafl means kings table in Old Norse, the Viking language. 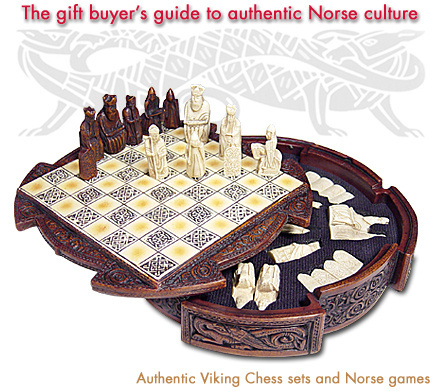 The Viking game Hnefatafl still enjoys a large following today and is our best selling gift. Hnefatafl is the perfect gift for that hard to buy for Viking in your family. We acquisitioned The Viking Trader, from the late Donald Hansen, the original Viking trader, www.VikingTrader.net Donald was of Danish descent and enjoyed sharing his Danish heritage and lecturing extensively about Viking culture. The Viking Trader specializes in authentic Danish handmade Viking Jewelry and Swedish handmade Viking glass reproductions. The Danish Viking jewelry and Swedish glass perfectly complement our own Norwegian Viking jewelry gifts. We offer Norwegian, Danish and Swedish Viking gifts that are made in their respective countries, and are sold in the Scandinavian museum stores throughout Scandinavia.We also sell wooden Norwegian and Viking ship Danish model boat kits, form the renowned Danish Billing Boats. You don’t have to be of Norwegian, Danish, Swedish, Scandinavian or Viking decent to appreciate our extensive line of gifts. There’s something for everyone at NorseAmerica!